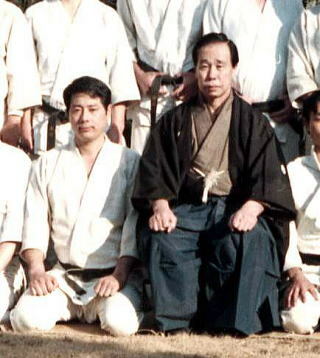 Keisetsu Yoshimaru (吉丸慶雪) trained under Yukiyoshi Sagawa from 1961 to 1976. After leaving Sagawa Dojo he also trained under Kinbei Sato (佐藤金兵衛), who had trained in Daito-ryu under Kakuyoshi Yamamoto (山本角義), another direct student of Sokaku Takeda.Kakuyoshi Yamamoto was born on March 3rd, on the 3rd year of the Taisho era (1914). Sokaku Takeda would come into the restaurant where Yamamoto was a cook, and despite an initial impression of Takeda as an evil old man, after several visits they began a conversation. "I’m a Bujutsu-ka" said Takeda, and after talking for a while he said "Come and try! ", so Yamamoto started training under Sokaku Takeda in Showa year 12 (1937).In Showa year 16 (1941) Yamamoto became an uchi-deshi, and took over much of the care and feeding of Takeda, who was no longer physically able to care for himself. Takeda would apologize "Yamamoto, I’m sorry, I’m sorry", as he was carried on Yamamoto’s back. Yamamoto noticed that Takeda sensei’s abdomen was covered with small cuts. This was from a knife that he would carry in his kimono wrapped in a towel. The knife would often slip out of the towel while he was instructing, causing the small cuts – something that most students would never see. Takeda, a veteran of many violent incidents in his youth, was always armed, and would carry this knife with him at all times until his death. 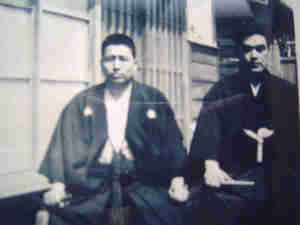 Yamamoto attended Takeda as he passed away on April 25, Showa year 18 (1943), in a ryokan in Aomori. After Takeda’s death Yamamoto took two Kanji from Takeda’s formal name and changed his first name, Tomekichi, to Kakuyoshi, in order to honor his teacher Takeda Sokaku Minamoto no Masayoshi (武田惣角源正義).Kinbei Sato was born in Taisho year 14 (1925) in Fukushima. Sato studied a large number of arts under a variety of instructors, including the noted Chinese martial artist Wang Shu-jin, and Daito-ryu Aiki-jujutsu with Kakuyoshi Yamamoto.This is the second part of a two part translation of the summary section of "Aikido no Ogi" (合氣道の奥義 / "The Secrets of Aikido") – "Aiki no Rentai" (合気之錬体 / "The Conditioned Body of Aiki"), by Keisetsu Yoshimaru . This section contains a summary of the quotes from Yukiyoshi Sagawa relevant to the conditioning of the body necessary for Aiki.You may want to go back and read part 1 before you continue any further. Keisetsu Yoshimaru trained in Daito-ryu under Yukiyoshi Sagawa from 1961 until 1976, after which time he separated from Sagawa Dojo. He continued to train in Chinese Bujutsu and other arts, such as a separate line of Daito-ryu descended from Kakuyoshi Yamamoto, who was, perhaps, the last student of Sokaku Takeda. He later established his own organization, the Aiki Rentaikai (合気練体会). He published a number of interesting books in Japan, and remains a somewhat controversial figure in Daito-ryu. Some of the most interesting information in his books is his collection of quotes from Yukiyoshi Sagawa, many of which have never been translated into English before. Yukiyoshi Sagawa started training with Sokaku Takeda around 1914, about a year before Morihei Ueshiba met Takeda at the Hisada Inn in Hokkaido. He was once considered to be the successor to Takeda Sokaku. In the Dojo there are people with many different ways of raising their hands. You could even say that each person is unique to themselves. As for different ways of grabbing and so forth, that’s really not very relevant, because it’s really a matter of a problem with the person who is raising their hands. I think that people are often told to relax their shoulders. This is an extremely important thing. As to how you actually relax your shoulders? That’s not taught even at Sagawa Dojo. Everybody must research that on their own. However, it may be one of the strengths of Sagawa Dojo that you learn to judge what is mistaken through your own research. Of course, you can’t get to that judgement right away.The Aiki-age of Sagawa Dojo is like this. Absolutely no bending the wrists, close your armpits, focus your power on the point at which you are grabbed (Aiki is an internal sense, so this is difficult), relax your shoulders and raise your hands up without changing. That’s all.Lastly, concerning Aiki. First of all, in Sagawa Dojo, "power" (力 / "chikara", also meaning "strength") and Aiki are completely seperated. And when speaking about "power", it’s different from the kind of power that we normally use. "Martial" power (武術的な力 / "bujutsu-teki na chikara")? Some people call it that, and some people call it the power of the extensor muscles. "T" shihan views the "extensor muscles" explanation negatively. I think that most of the students in the Dojo see it that way as well.The first thing that new students learn is Martial power. They learn the effecient use of power in order to lay the groundwork for Aiki. If you are intuitive then you may be able to grasp Aiki, although some people misunderstand, but if you don’t lay the groundwork well then intuition won’t help you at all. One way to misunderstand Aiki is to mistake the power that your body gains through this groundwork for Aiki. The reason for this is that this power appears similar to Aiki when seen from the outside. Most of the black belts in the Dojo have this problem. But the Aiki that is spoken of in Sagawa Dojo is a completely different thing. Sensei often said that if you don’t change your way of thinking you will not be able to glimpse Aiki. However, that Aiki is in fact an extension of this groundwork is not mistaken.I guess that the only way to understand this is by going through the conditioning and changing your way of thinking. 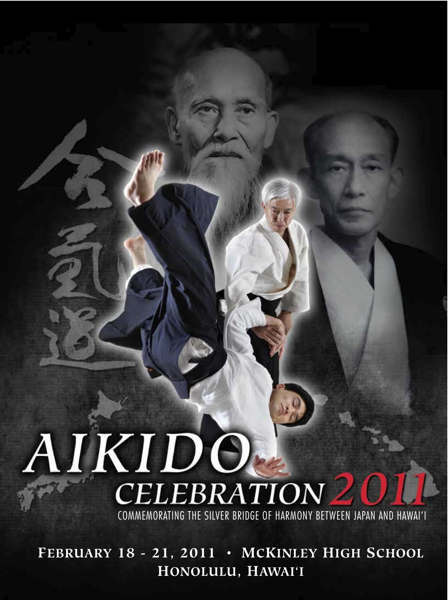 "Aikido Celebration 2011 is an organization dedicated to the public commemoration of the 50th anniversary of the first and only visit made to Hawai’i by the founder of Aikido, OSensei Morihei Ueshiba. It is also an opportunity to recognize the efforts of the people in Hawai’i and elsewhere who made that 1961 visit possible, and to perpetuate the practice of Aikido in Hawai’i for future generations." Some 500 people from around the world attended the seminar, which featured instruction by Moriteru Ueshiba Doshu, Mitsuteru Ueshiba Waka Sensei, Yoshimitsu Yamada sensei from the New York Aikikai, Seijuro Masuda sensei from Aikikai Hombu Dojo, and a number of local instructors and instructors with local ties.Nobuyoshi Tamura had already accepted an invitation to instruct at the Aikido Celebration 2011 seminar, but passed away in July 2010, seven months before the seminar actually took place in Honolulu.In 1961 Morihei Ueshiba OSensei visited Hawaii in order to dedicate the newly completed Honolulu Aiki Dojo, the first Dojo outside of Japan built specifically for the practice of Aikido.Included here is the text of a short article that I wrote for the brochure about the two students of Morihei Ueshiba who accompanied him from Japan in 1961 on that journey – Koichi Tohei and Nobuyoshi Tamura. The photograph of Morihei Ueshiba with Koichi Tohei and Nobuyoshi Tamura at Honolulu International Airport that appears at the start of the article also appeared in the brochure. The other photographs have been added for this article.Koichi Tohei had been coming to Hawaii since 1953 – there is a small room in the Honolulu Aiki Dojo that was originally planned so that Tohei would have a place to stay when he came to visit Honolulu from Japan. Nobuyoshi Tamura was one of the young instructors at Aikikai Hombu Dojo, and this was his first trip to Hawaii. You may also be interested in reading these two articles in which Koichi Tohei recounts some of his experiences in coming to Hawaii, "Morihei Ueshiba: Untranslatable Words" (Nobuyoshi Tamura also appears in this account of the Founder’s visit to Hawaii) and "Koichi Tohei: Aikido Comes to Hawaii".There is also a two-part interview with Nobuyoshi Tamura (part 1 and part 2) if you are interested in learning more about Tamura’s history in Aikido.Lastly, Ni-Dai Doshu Kisshomaru Ueshiba speaks about his first trip to Hawaii, in 1963, in "Kisshomaru Ueshiba, Mangos and Johnny Walker Black: Ni-Dai Doshu Comes to Hawaii". 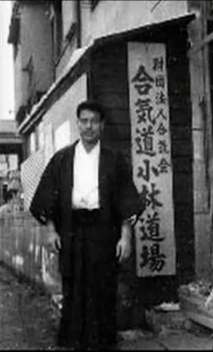 Part 1, in which Kobayashi sensei discusses his interest in Japanese pro-wrestling, and a little bit about what training at old Aikikai Hombu Dojo was like in the 1950’s.Part 2, in which Kobayashi sensei and Nakayama sensei discuss a little bit about the teaching methods at Aikikai Hombu Dojo in the 1950’s, and about the first public demonstrations of Aikido in Japan.More information about Yasuo Kobayashi, and Aikido Kobayashi Dojo, is available on the Kobayashi Dojo website.